When I was a kid I had a poster in my room for a number of years. The poster had this breathtaking view of a coastline adorned with stone fortresses and houses with terracotta roofs. It made me wonder if a place so stunning really existed, or it was merely a computer-generated imagery from someone's imagination. The poster looked like this. Years later I finally landed myself in Dubrovnik, immersed in this otherworldly views of the Dalmatian coast. Fort Lovrijenac, also known as the Red Keep in King's Landing. 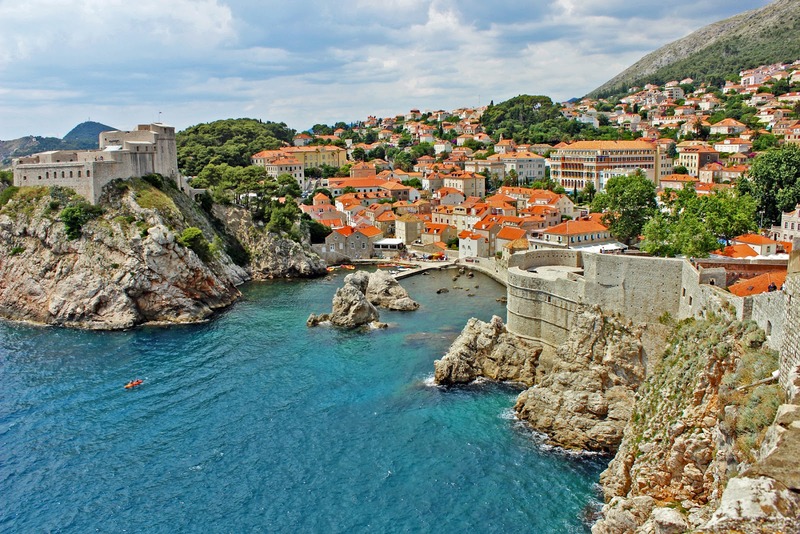 Climbing the old City Walls of Dubrovnik is a must because that's where you will get the best views of the Old Town. Like this aerial view of the bustling Stradun, main street of the Old Town. This was the view from Minceta Tower. Split is the second-largest city in Croatia, and about 3-hour drive from Dubrovnik. It's known for the Diocletian's Palace, erected by the Roman emperor in the 4th century. Unlike the Old Town of Dubrovnik, people continue to live inside the Old Town of Split. So don't be surprised if you see people drying their laundry outside of their residences which so happen to be next to a historical building or monastery. We climbed up the Bell Tower of St. Domnius for this stunning view of the entire City. In the distance, you can see the seaward walls separating the Old Town from newer parts of Split. If you are acrophobic or suspect you might be, I would suggest you not going up the Bell Tower. I was never afraid of height but I almost had a panic attack up there. As I was climbing up the super steep stairs, I noticed that the staircase was open and there were no balusters on either side! All I got to hold on to was the very flimsy handrail that appeared to shake as I gripped tight on it. The winds got stronger as we were higher up in the tower, and I felt like I was going to be blown into the open air. Horrible feeling but alas I made it, and the views up there made it all worthwhile. Golden Gate, Grgur Ninski statue. The Old Town is not short of restaurants and cafes for al fresco dining. We tried this small restaurant called Posejdon in quieter corner and we loved it. I had this octopus salad with balsamic reduction. And this fish broth, the best I've ever tasted. I will be back to write about our next stop, Turkey.